Turns out that this guy had one hip resurfaced 8 years ago (as part of a study) by Dr. Amstutz and the other hip resurfaced by Dr. Mont in2006. He gave Dr. Mont the highest recommendation. I did as much research as I could and made the decision that I would seek out Dr. Mont. 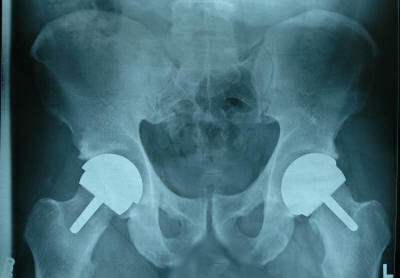 December 2007 I sent Dr. Mont my x-rays and he determined that I was a candidate for hip resurfacing. Most of us with osteoarthritis are. The real problem was asking myself if I really needed the procedure… now, verses waiting several years down the road. I was able to play full-court basketball but during play I would get stabbing pains if I moved laterally or twisted. Mostly I was tentative to move always anticipating the pain (that may or may not occur). After exercise I was in pain, walked with a notable limp. We recently had a baby so I was constantly having to lift my legs over the baby gates. I would just stand in front of the gate anticipating the pain I was going to have as I lifted each leg over the gate. My understanding was that with hip resurfacing I could go back to an active lifestyle (after fully healed of course). Dr. Mont’s “opinion” from the Dr. Mont surfacehippy video) was that these prosthesis could last a lifetime but only ~8 years of data has been collected. So I decided to not only get the left hip fixed but go for the right as well. If you look at my x-rays, the right is just as bad as the left but, pain-wise, was overshadowed by the left hip and left Achilles. So in December 2007 I arranged for a June 2008 surgery date. This allowed me time to prepare financially and get things arranged for an anticipated 6 weeks out of work. Dr. Mont provided me the name of a partner Podiatrist (Dr. Bradley Lamm) and surgery was arranged for right hip on 6/5/08 followed by the left hip on 6/12/08. After Dr. Mont would finish, Dr. Lamm would repair my Achilles. First, Dr. Mont’s staff is awesome, from the insurance person to the nurses and other support staff. Dr. Mont actually called me about 3weeks after getting my x-rays to answer all my questions. Anyway, Dr. Mont’s staff sends you a pre-op check-list. Since I live in Alabama and Sinai is in Maryland, I arranged with my local hospital for pre-op x-rays, EKG, and blood tests. The local hospital forwarded test results to my local primary care physician and Dr. Mont. In addition to pre-op testing, I gave 2-pints of blood in preparation for surgery. This was good since they ended up giving me my blood back to bring my blood count up after each surgery. On June 3rd I flew to MD and meet with Dr. Mont and Dr. Lamm on June4th. They answered my remaining questions. Dr. Mont is a super type-A personality but I liked him from the get-go. While he displayed great confidence he did not interject arrogance, a subtle distinction. Dr. Lamm (Podiatrist) is a more relaxed “nice guy” type but you could tell he knew his stuff, both top in their fields. June 5th, right hip day. I arrived at 0600 and was admitted. Since I could not afford for my family to be with me I was alone (but not forgot). The admission staff made me feel very comfortable. They put my stuff in a secure location and fitted me with an IV. The pre-op nurse asked questions followed by the operating room nurse, and then the anesthesiologist. For surgery #1 I qualified for a spinal or. general anesthesia. I choose spinal. Prior to wheeling me into the operating room (OR) I was given some “happy juice” (valium and something that inhibits memory). I moved myself from the bed to the operating table where I sat up while the anesthesiologist administered the spinal. Did not hurt, just felt a pinch. After the spinal was done they tested the feeling in my limbs and after determining the spinal was working they knocked me out …. last thing I remember was the time … 7:30 AM. The next thing I knew, I woke up (very refreshed) and the clock read 10:00 AM. Since I had a spinal I could not feel my legs (a good thing). I remained in the recovery room until I could wiggle my toes. I had an IV connected to a button. I could self administer pain medication (once every 10 min) by pressing the button. I was on Delauden not morphine. Since I have never had surgery before I didn’t really understand how to use the button (even though they explained it, if you have pain hit the button). So I hit it every 10 min. I think I hit it to much because I started to get nauseas. They gave me something for the nausea so, while my tummy was uncomfortable, the nausea was under control. I remember trying to watch game one of the NBA finals. It was hard to focus on the TV. Once I understood the button thing I started backing off its usage. I used my cell phone to record the time I hit the button. Then I would set an alarm for 30min and if not in pain would extend to 45 min and eventually to 1 hour before hits. The longer waiting between hits keep my stomach and head clear. The first night is very hard, I had a vascular stimulator on my legs (air bag that inflates in sequence to reduce the chance of blood clots) and sleeping on my back was something to get used to. I also had a catheter, which they put in while I was in the OR (a good thing to have the first night for sure). In addition, I had a tube, called a “drain” coming out of my leg, just above the incision. I survived the night and the next day (or day 1 – post op as they call it) the physical therapy guy was in to get me up. I stood for the first time. My leg felt like a heavy brick. I took about 3 steps before sitting in a recliner they wheeled behind me. Dr. Mont came in and told me everything went very well and that I would feel “5000times better the next day”, which I didn’t believe based on how I was feeling at the moment. Oh, prior to standing they removed the injector and I switched to pain pills. One or two every 4 hours. Post-op day 2, I felt 5000 times better. Its true, my PT started and while my leg still felt like a brick I was already starting to make gains. Again, you don’t sleep to well for the first 4 days or so. They gave me Ambian which helped me get a few hours sleep. On post-op day two they removed the catheter (not to bad) and the IV from my arm (but left the thing in my hand). So the only thing I had to drag around was the drain. PT continued and I gained mobility and strength each day. Post-op day 3, they removed the drain. I was free of tubes and wires. The hospital provided me a “grabber” and “foot mover” thing. I used both a lot. The grabber for getting my urinals to grabbing my cell phone. The hardest part about post-op days 3 through 6 were going to the bathroom. 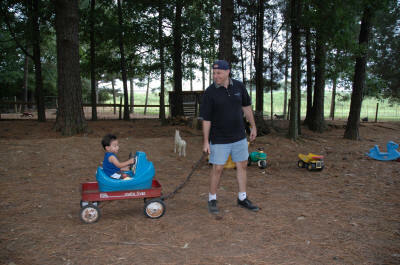 During the day I laid in the recliner so it was not to bad dragging myself up and using the walker to use the john. But at night, my legs were hooked to the stimulator which meant I had to pee in these plastic containers. Not so bad but I had a spill and had to get up and clean-up (with help from the nurse). Not fun, but I got through it. 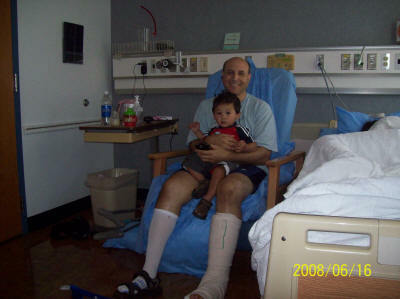 On day 3 I was moved to the B5 rehab unit at Sinai. These folks are wonderful. I had 1 1/2 hours of PT and Occupational Therapy (OT) twice a day. I learned how to negotiate a single step, stairs, ramps, and everyday things we take for granted. The PTs had me do arm and leg strengthening exercises and I noted improvement each day. Since I was from out-of-state, I was able to stay in rehab until my second surgery. Believe me, I had to give great pause if I wanted to go through the whole thing over again. Plus, I had the Achilles repair on top of the left hip resurfacing. But my right leg was strong and I felt good so I went though it again, just 7 days after getting my right hip fixed. Just about the same experience the second time around. However, I had ” general anesthesia” since Dr. Lamm had to fix my Achilles following Dr.. Mont. Again, both resurfacing and Achilles repair went fine. I used the pain pump sparingly from the start this time and felt better for it. They controlled any nausea and by day 3 I felt much better. 2nd surgery was on a Thursday and I was transferred to rehab on Sunday. Discharged on Wednesday and flew back to Alabama on Friday. No issues. Some notes: I did have a low grade fever after the first surgery which was treated with Tylenol or something to reduce fever. I was told this is normal. The fever only came at night and was usually gone the next morning. After the 4th day no fever. Gadgets to have, the grabber, the foot mover thing, cell phone. Bring toothbrush and favorite soaps (electric shaver is best). I tried to clean-up every day to keep a sense of moving forward rather than sitting in misery. The more I could do for myself, the better I felt. At home, I installed railing in the bathroom and we have a shower chair. Due to the cast on my left foot I can’t take a shower yet so its damp wipes for now. Thanks to my wife and kids for helping me during recovery. I do my PT twice a day and continue to get stronger.